Over the decades, there have been frequent protests outside the stores. Lawsuits against the retailers and beer distributors have been filed. Boycotts of brewers that sell to the stores have begun with enthusiasm. All those efforts have sputtered, though, and little has changed. 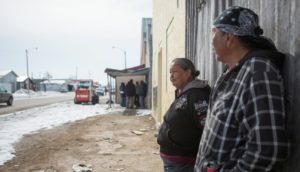 Now many residents of Nebraska and South Dakota are pushing for the liquor stores of Whiteclay to be shut, disgusted by the easy access to alcohol the stores provide to a people who have fought addiction for generations. The Nebraska authorities, in turn, have tightened scrutiny of the stores, which sell millions of cans of beer and malt liquor annually. Last year, for the first time, the state liquor commission ordered the stores’ six owners to reapply for their liquor licenses…The issue has left people in South Dakota and Nebraska deeply divided. Most agree that alcohol abuse on the reservation is an entrenched problem, but they are unsure of the solution — and who is responsible. The grim scene in Whiteclay has scarcely changed for decades. 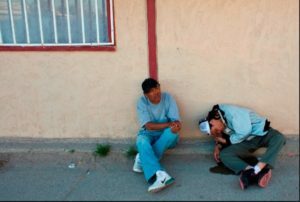 Particularly in the warmer months, Native Americans can be seen openly drinking beer in town, often passed out on the ground, disheveled and ill. 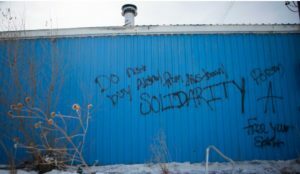 Many who come to Whiteclay from the reservation spend the night sleeping on mattresses in vacant lots or fields. Even under the chill of winter, people huddle outside the liquor stores, silver beer cans poking from coat pockets. A man sits outside WhiteClay Grocery, where he will likely spend the night. Next to him, another man lies passed out in his own urine. 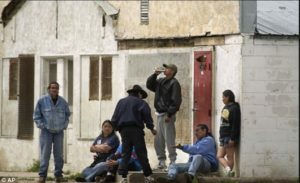 Others argue that the problem of alcohol abuse on the reservation goes well beyond the stores in Whiteclay. Even some Native Americans said they were uneasy over upsetting the status quo. Vance Blacksmith, 47, a Native American and teacher on the reservation, said he favored leaving the stores alone. Terry Robbins, the sheriff of Sheridan County, has found himself at the center of the fight over Whiteclay. Sheriff Robbins echoed a common sentiment heard from both Nebraskans and Native Americans: If the stores lose their licenses and close down, people in search of beer will just drive farther to get it, endangering themselves and others on the roads. He favors containing the problem in Whiteclay, rather than allowing it to spread out over the county’s nearly 2,500 square miles. Passed out in fron tof liquor store in WhiteClay. Photo-indianz.